Together with our principals we are with increasing frequency delivering whole packaging lines as Turn Key solution to our customers. Our principals are in charge for the whole manufacturing and/or packaging line. We offer processing systems, vertical filling machines, flowpack machines, Pick & Place robot solutions, cartoning machines, toploader solutions, case packers, sack filling machines and palletizing machines. 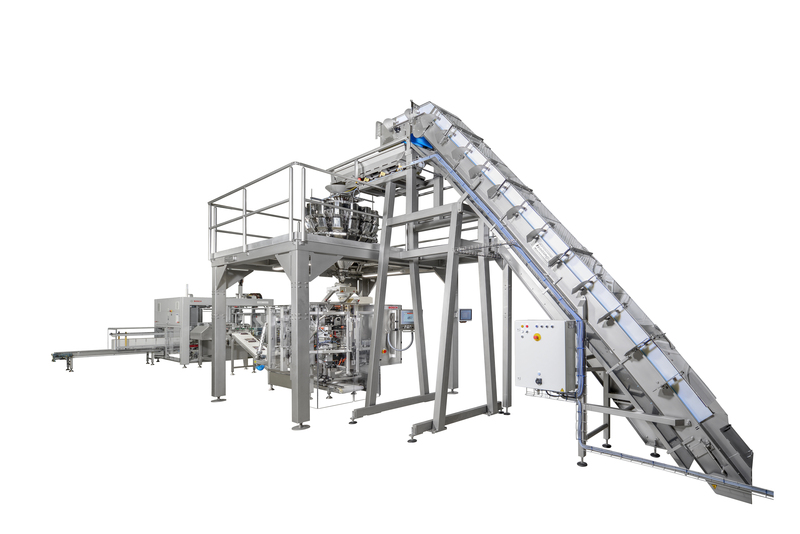 For the vertical filling machines we, depending on the product, deliver auger fillers, multi head weighers, linear weighers, counters and volumetric fillers. For Flowpack machines we deliver buffer systems, grouping and infeed systems in between the process and packaging lines for the products. We also deliver filling lines for sacks and “Big-Bags” and palletizing stations for sacks. We integrate quality control systems for packages like X-Ray systems and serialization. We can also integrate machines from a third party in the packaging lines. Our principals are in charge of the whole layout and the integration of these machines to a functioning total line. When investing in a complete packaging line the interfaces, coordination of overall time schedule, including test run, delivery, installation and commissioning of the machines and systems are top priority. Our principals are in charge of the total delivery. This decreases the resource needed at our customers, speeds up the project timeline and the commissioning of the packaging line, as well as decreases risks. The packaging line can be tested at our principals’ factory before delivery. A test run before the delivery will ensure a fast installation and commissioning. Our principals also perform CE-markings on individual machines and complete packaging lines. Packaging lines and systems delivered by Bosch are all equipped with the same touchscreen panel. The operator in charge of the packaging line can control the different systems and machines in the packaging line by similar looking touch screens. The machines in the packaging lines can also be connected to the same network and the production information can automatically be collected in a centralized database. Our principals perform CE-markings on single machines and whole packaging lines. The responsibility for this lies with one partner. Our principals offer comprehensive service and maintenance contracts for their delivered packaging lines. Together with our customers we tailor-make service and maintenance contracts that suit them best: maintenance visits once a year or more often, spare part check-up and storage, further training and possible modernizations of the machine or the line. Kafeko’s own local service personnel also participate in the service and maintenance. Our goal for the packaging line is to be as profitable as possible. The packaging lines of highest quality delivered by our principals ensure a high OEE-level, minimized losses, a high product quality and an easy and safe way to run the packaging line for the operator.